More than 487,000 people have arrived at Europe’s Mediterranean shores in the first nine months of 2015, double all of 2014 and the highest number since record keeping began. The journey is fraught with danger—nearly 3,000 people have perished crossing the Mediterranean this year alone, not counting those who lost their lives en route—and for those who do make it, their future in Europe remains highly uncertain. With the unprecedented volumes of new arrivals, even the best-prepared European countries have reached a breaking point in their ability to meet European Union (EU) standards for receiving and processing applicants. Those with less experience managing immigration or hosting asylum seekers have given in at times to rash or counterproductive impulses. The question of who is responsible for those arriving has reignited deep internal divisions between Member States. Months of tense negotiations over efforts to relocate tens of thousands of asylum seekers from Greece and Italy resulted in a September 22 majority vote among EU interior ministers approving the relocation of 120,000 refugees across the continent, overriding objections to the redistribution scheme from several Eastern Member States. Frontline states such as Greece and Italy bear a disproportionate responsibility for receiving new arrivals, although most newcomers quickly move on to wealthier European Union (EU) countries including Sweden and Germany—which in 2015 received almost half of all EU asylum applications. In the process, a new front line has emerged in transit countries such as Hungary and Croatia that suddenly face enormous pressures at their borders, and in the case of Hungary the reaction has been to erect barbed-wire fencing and try at times to contain (or push back) the asylum seekers. The flows themselves are extremely complex and driven by a complicated mix of factors. Although the majority of those arriving have protection needs (approximately three-quarters will qualify for refugee status or other protection), many are departing for Europe not from their countries of origin—where they face violence and persecution—but from places of first asylum, such as Turkey and Jordan, that have become overwhelmed by protection responsibilities. Globally, 86 percent of refugees are hosted in the developing world, which is rife with its own economic and political challenges. Ninety percent of the 4 million Syrians displaced outside their country’s borders, for instance, are located in just three countries—Turkey, Jordan, and Lebanon. As the war continues into its fifth year and resources and opportunities in these countries dry up, more of the displaced have begun looking to Europe for shelter. As the sense of chaos at Europe’s borders escalates—with 4,000 arrivals per day on the Greek islands and tent camps erected almost overnight in German cities upending any remaining sense of order—European destination countries find themselves with no easy solutions. What is clear is that an effective response will need to be grounded in an understanding of the root causes of the flows, why they have spiked now, and what is likely to be the next pressure point. The costs of failure could be high. In the face of seemingly endless spontaneous arrivals, systems are caving under pressure, and trust and solidarity are eroding—between Member States, between publics and their governments, and within the global-protection system as a whole. The flow of migrants and refugees crossing the Mediterranean has increased dramatically, with the United Nations High Commissioner for Refugees (UNHCR) recording more than 487,000 arrivals by sea so far this year, up from 23,000 three years ago. In August alone, there were more than 130,000 maritime arrivals—a near quadrupling of the number seen in August 2014. Central Mediterranean Route (Italy and Malta): More than 120,000 migrants and refugees arrived in Europe via the Central Mediterranean between January and September. Most have traveled on smugglers’ boats departing from Libya, Tunisia, or Egypt. This extremely dangerous route dominated flows during 2014 and was the location of large-scale tragedies in October 2013 and April 2015, prompting calls for an EU-level response. The Central Mediterranean has diminished in use in 2015, partly due to increased instability in Libya, but remains the primary entry point for sub-Saharan nationals with few alternative routes. Eritreans and Nigerians have been the largest groups traveling the Central Mediterranean in 2015. Eastern Mediterranean Route (Greece/Aegean Sea): The Eastern Mediterranean has become the primary maritime route in 2015. 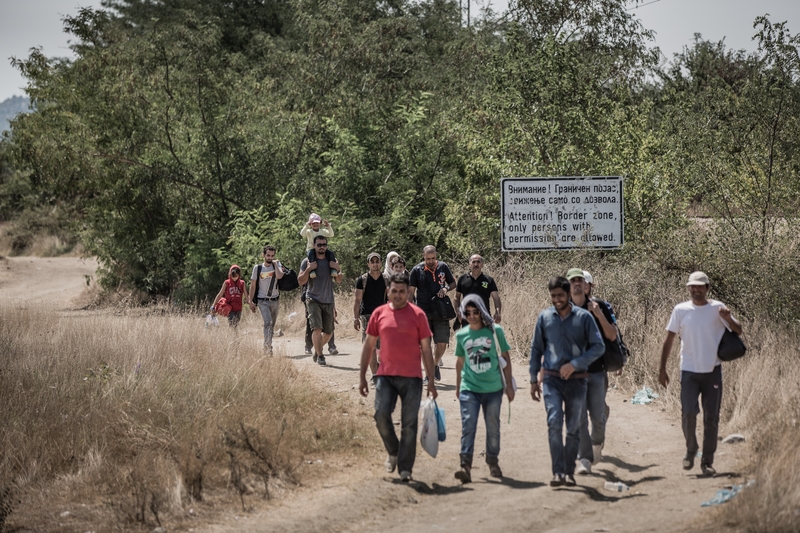 More than 350,000 individuals have crossed from Turkey to Greece (the vast majority to Greek islands like Lesbos and Kos near the Turkish coast) in the first nine months of 2015. The shift in flows to the Eastern Mediterranean has been primarily driven by a change in migration patterns among Syrians, who have found it easier and safer to travel to Europe via Turkey to Greece. The short journey from Turkey to the Greek islands, just a few miles away, is safer than the much longer Central Mediterranean route. There are some reports of refugees undertaking the journey themselves, without relying on smugglers. Afghan and Pakistani nationals also arrive via the Eastern Mediterranean. Western Balkans (Hungary): More than 155,000 people crossed from Serbia into Hungary between January and August. Two primary groups travel this route: Western Balkan nationals—especially from Kosovo and Albania—and migrants and refugees traveling onward from Greece to reach the rest of the European Union. As arrivals to Greece have increased, so too has traffic through the Balkans and across the Hungarian border. The largest numbers come from Syria—accounting for more than 50 percent of arrivals in 2015—followed by Eritrea, Afghanistan, Kosovo, Nigeria, Iraq, and several West African states including Senegal, Gambia, and Mali. Of those submitting asylum claims, Syrians and Eritreans are the most likely to be granted protection (more than 90 percent of both groups receive refugee status or another form of protection). Afghans, Iraqis, and Somalis are also likely to be granted refugee protection, while fewer than 5 percent of claims from Western Balkan nationals are accepted. All three routes receive mixed flows composed of three primary groups: 1) individuals whose protection claims are likely to be recognized by European authorities, such as Syrians and Eritreans; 2) individuals fleeing instability or violence in their home countries who may not qualify for refugee status but are still at risk for other reasons including Somalis and some Syrians; and 3) migrants who feel compelled to leave their countries for largely economic reasons—Western Balkans and sub-Saharan nationals, for example. Despite the distinct legal categories into which new arrivals are slotted, individuals have complex and overlapping motivations for leaving their origin countries that defy simple categorization. Even for those fleeing conflict or oppressive regimes, it is often difficult to pinpoint one precipitating push factor, especially one that aligns with the legal grounds for claiming asylum. The 1951 Geneva Convention offers a single definition of a refugee: someone fleeing a well-founded fear of persecution due to race, religion, nationality, membership in a particular social group, or political opinion. Ultimately, opportunity differentials continue to drive most movements, even for refugees. For many, reaching Europe means the chance to build or regain a normal life that has been disrupted by political or economic turmoil, conflict, or persecution. Thus while international law draws a bright line between refugees and other migrants (requiring very different treatment for the former), this distinction is much more nuanced in practice. Even the motivations of those seen as primarily “economic migrants” may not be completely clear. Western Balkan nationals, for example, face extremely high unemployment and poverty rates, and have a clear economic incentive to seek entry to Europe. Roma or other minority ethnic groups that face severe and systemic discrimination in their home countries and could, in some cases, be considered grounds for refugee status represent a substantial share of those making the journey. Motivations to move may also shift as conflicts wear on. While more than 4 million Syrians have found safety in neighboring countries, these countries have yet to provide the full legal status or rights entitled to refugees under the 1951 Refugee Convention—including the all-important right to work. With few opportunities to resume a normal life or economic self-sufficiency in first-asylum countries, and little hope that conditions will improve in the future, many Syrians are choosing to search for their own solutions in Europe. The diversity of these flows—both in terms of the nationalities of those arriving and the motivations of individuals themselves—creates an added challenge for asylum authorities trying to determine who is a “genuine” refugee, who may qualify for another form of protection, and who does not have legal grounds to stay in the European Union. Each arrival must receive an individual assessment of his or her claim for protection, often a lengthy and resource-intensive process, and backlogs of claims awaiting adjudication have begun to grow in many Member States as authorities lack the means to keep up with the rising number of cases. But even those whose claims are denied stand a chance of remaining in the European Union, as return rates for failed asylum seekers remain low. The arrival of Syrian refugees in Europe is not a new phenomenon. The Syrian civil war erupted in March 2011, leading to a steady escalation in the number of Syrians seeking protection in Europe since. These arrivals had already revealed fissures in the Common European Asylum System (CEAS), which provides common standards governing processing and reception in each of the 28 EU Member States’ national asylum systems. But the near-exponential surge in the spring and summer of 2015 has nearly brought the struggling CEAS to its knees, overwhelming the capacity of policymakers and publics to respond. Many onlookers were left asking: why now? This escalation can be attributed to a confluence of intersecting push-and-pull factors, some of which have been simmering for years (and have simply been exacerbated by the passage of time and/or recent triggering events), others of which are new. The combination of push factors includes: (1) the ongoing violence and instability in origin countries that have both precipitated mass movements and made return impossible (at least in the short to medium term); (2) the deterioration of conditions in countries of first asylum which has led some, including Jordan and Lebanon, to tighten their borders, limiting access to nearby safe havens for the displaced; (3) the continued lack of opportunities to work or enroll in school for most refugees, which is a major driver of onward movements; and (4) geopolitical changes that have closed off alternative destinations, such as Libya. While many of these conditions are not new, they have intensified over time. The longer people remain displaced, with little prospect of return, the greater the burden on host countries that are themselves facing enormous political and economic struggles. Turkey, for example, has spent more than US$6 billion hosting refugees. In Lebanon, where tensions have been particularly acute, Syrians now comprise close to one-quarter of the population and by some counts Syrian children exceed the entire capacity of Lebanon’s public schools. More than half of Syrians in Lebanon and one-sixth of refugees in Jordan are living in extreme poverty. Services in host communities are inundated, and opportunities to access essentials like education or health care have become limited for refugee and host communities alike. And as times get tougher, public opinion can sour. Initial generosity toward short-term “guests” does not always translate to support for permanent neighbors, who may compete with natives for jobs and limited spots in schools. Geopolitical and economic changes over the last several years have added to migration pressures in the region. The armed conflicts and political crises currently facing Libya and Egypt have led not only to the suspension of bilateral and EU migration-enforcement agreements with those countries, but disrupted regional labor markets and migration flows within northern Africa. Libya in particular was a regional hub for migrant labor before the Arab Spring. Estimates put the migrant worker population in the country in 2011 at close to 2.5 million, including many sub-Saharan nationals. Many migrants who returned to work in the country since the overthrow of the Gadhafi regime have become stranded in an increasingly unstable Libya and chosen to cross to Europe in an effort to escape the growing conflict. On the other end of the spectrum, policy announcements by European governments, as well as the creative use of social media, may have created new enabling (or pull) factors. Some individuals who had previously resisted leaving may feel emboldened by news of their compatriots having successfully arrived in Europe alongside reports of countries like Germany or Sweden granting status to most Syrians who make it to their territory. Social media enables these “success" stories to spread instantaneously, along with tips on how to navigate the journey and access critical services upon arrival. New initiatives like the “Airbnb for refugees” in Germany and Austria—albeit small-scale—may make it easier for refugees who have fewer support systems or networks to navigate unfamiliar environments. In addition, the chaos at European borders means that even if individuals do not qualify for protection, there may be a long lag time before their claims are adjudicated, during which time many travel onward illegally through Europe. Finally, classic patterns of chain migration may also be responsible for some of the new flows, as settled migrants reunify with family and friends. And this may just be the tip of the iceberg. The refugees and migrants currently arriving on Europe’s shores are almost 70 percent male, and media and nongovernmental organization (NGO) reports suggest that those arriving are “first movers” with family still abroad who intend to join them through legal channels once their claims are granted. The sheer scale of displacement worldwide has tested the limits of the international protection regime built around the 1951 Refugee Convention and revealed existing fault lines and failures in current humanitarian policies. As of 2014, UNHCR estimates that 59.5 million people have been forcibly displaced from their homes, of whom 19.5 million are refugees outside their countries of origin. Three primary factors have limited the system’s capacity to respond. First, existing approaches to protection have proven singularly unable to find solutions for long-term displaced populations. Almost half of refugees under UNHCR’s care in 2014 had been displaced for five years or more. For most, return to their origin country or resettlement in a third country remains a distant possibility; in 2014, approximately 105,000 refugees were resettled through UNHCR, representing less than 1 percent of all refugees displaced globally. Humanitarian responses in refugee situations have been criticized for focusing too heavily on the “care and maintenance” of refugee populations, leaving refugees essentially “warehoused” for years on end, their lives in limbo, with little focus on long-term, sustainable solutions. Second, the international community has failed to offer anything like meaningful burden-sharing to host countries in conflict regions, which care for the vast majority of the world’s refugees. Neither assistance funding nor resettlement places—insufficient before the latest surge in displacement—have increased apace with the level of need. And the resources that are available are finite, and dwindle as time wears on. In Lebanon, for example, the World Food Program (WFP) announced in July it would have to reduce food vouchers given to Syrian refugees by half. The 2015 UN joint appeal for the region had received just 40 percent of requested funding as of September. Although all categories of the appeal are underfunded, support for livelihoods development and host-community resilience has been particularly low, adding to the prospect of long-term vulnerability in the affected countries. European leaders acknowledged the significance of the funding gap facing the Syria refugee response at an extraordinary EU summit on September 23, promising an additional 1 billion euros to UNHCR and WFP to ease the deficit (half will come from EU funds and half from Member States). Prior to the latest announcement, European countries had provided more than one-third of the funding for the United Nations’ response, with the United States providing a further one-third of the financing. But outside Europe and the United States, financial support for the Syria region has been less than forthcoming. Other than Japan, no countries in Asia or Latin America have contributed, and while Kuwait has been the third largest financial contributor to the international response, other Gulf countries such as Saudi Arabia have come under criticism for not doing more. Furthermore, UNHCR-reported resettlement departures have barely increased over 2009 levels. Countries not immediately affected by the crisis have been slow to offer resettlement places. Recent offers by traditional resettlement countries like Australia, Canada, and the United States to provide an additional 10,000-12,000 places each for Syrians are just a drop in the bucket in comparison with the 4 million refugees who have been displaced. And so far offers from countries without established resettlement programs have been even less forthcoming. Finally, the principles of protection enshrined in the Refugee Convention (in particular the requirement that refugees be located outside their country of origin) have resulted in territorially based national asylum systems—refugees must gain access to a state’s territory in order to exercise their rights to claim asylum. At the same time, wealthy nations have undertaken a large-scale effort to secure and “push out” their borders. Visa restrictions and airline sanctions, for example, have made it difficult—if not impossible—for most of those seeking protection to reach their destinations through common means of entry. As a result, refugees are forced to rely on increasingly risky and dangerous routes, often requiring the use of smugglers, to gain entry to asylum systems in Europe and elsewhere. Although the absolute scale of protection needs facing Europe is still smaller than that in many countries of first asylum—though this is rapidly shifting—the unplanned, fast-changing, and unevenly distributed nature of the flows has caused serious difficulties for countries with highly organized immigration and integration systems, labor markets, and social services. Emerging struggles in many European countries to continue to provide for new arrivals at a high standard—the deteriorating conditions on the Greek islands are one highly visible example—raise the possibility that there may be a limit to what Europe can handle. Several international aid organizations, normally operating in countries like Iraq or Pakistan, have now launched assistance programming in Europe (for example, the International Rescue Committee, World Vision, Save the Children, and Doctors without Borders are all now operational in Europe). Given that few truly innovative or large-scale solutions to the growing protection challenge have so far presented themselves, what is seen at Europe’s borders may not be a “crisis” but rather the new normal. Migration flows are inherently difficult to predict, but none of the push factors driving refugees and migrants to Europe’s shores appear likely to be resolved soon. Little progress has so far been made in resolving the political situation in Syria, suggesting ISIS and other extremist groups will have plenty of room to continue exploiting the power vacuum in large parts of the country. Related violence in neighboring Iraq is likely to add to the refugee flows. Meanwhile, patience and capacity in neighboring countries are clearly wearing thin. Jordan, Turkey, and Lebanon, for example, while generously opening their doors to millions of Syrians, have strongly resisted granting refugees formal legal status or rights that would encourage their long-term integration, instead referring to them as “guests.” As a result, refugees’ rights and opportunities in these countries remain limited. Both Lebanon and Jordan have also restricted access to their territory for Syrians, driving new flows to Turkey where authorities have turned a blind eye to smugglers moving people on to Europe. In the absence of a large-scale increase in support for these countries (both in terms of aid and resettlement), it should come as a shock to no one that refugees continue to seek more stable conditions and longer-term solutions in Europe’s asylum systems. Elsewhere, conflict and oppression seem unlikely to abate. Political oppression in Eritrea, including forced conscription, will continue to drive flows. At the same time, growing instability in Egypt and escalating conflicts in Libya and Yemen may prove to be new sources for refugee flows to Europe; violence in Yemen has already driven many to seek safety across the Gulf of Aden in Somalia—reversing long-time regional flows. Yet Europe has few early-warning systems in place equipped to predict mass movements before they happen. Indeed, migration is usually used as an indicator of brewing political conflicts or large-scale natural disasters, rather than a policy target in and of itself. In the short term, the usual reduction in Mediterranean arrivals over the winter months may not materialize as migrants and refugees use the shorter and safer crossing from Turkey to Greece. Against this new landscape, countries in Europe and elsewhere will have to think hard about how to approach their protection responsibilities. Giving in to the impulses to erect bigger fences without concomitantly dealing with the root causes of these movements will only serve to deepen the pockets of smugglers, not reduce the flows themselves. Most thinking has pointed to a need to approach refugee- and migrant-producing situations in a much more comprehensive way that moves beyond humanitarian and asylum tools alone. In a more connected and mobile world, waiting to deal with a problem until it reaches a country’s borders is not sustainable. In the same vein, providing protection can no longer be seen as a purely national responsibility; responses that mobilize both financial and political resources at the regional—and global—levels will need to become the new normal. Economist, The. 2015. How many migrants to Europe are refugees?” The Economist, September 7, 2015. Available Online. European Asylum Support Office (EASO). 2015. Annual Report on the Situation of Asylum in the European Union 2014. Luxembourg: EASO. Available Online. Eurostat. 2015. Asylum in the EU: Over 210,000 first time asylum seekers in the EU in the second quarter of 2015. News release, September 18, 2015. Available Online. Frontex. 2015. Annual Risk Analysis 2015. Warsaw: Frontex. Available Online. ---. 2015. Migratory Routes Map. Accessed September 23, 2015. Available Online. Guild, Elspeth and Karin Zwaan. 2014. Does Europe Still Create Refugees? Examining the Situation of the Roma. Queen’s Law Journal 40 (1). Hurriyet Daily News. 2015. Turkey urges world’s help on Syrian refugees as spending reaches $6 billion. Hurriyet Daily News, February 27, 2015. Available Online. Migration Policy Centre (MPC). 2013. Libya: Migration Profile. Florence: MPC. Available Online. United Nations High Commissioner for Refugees (UNHCR). 2015. Global Trends 2014: World at War. Geneva: UNHCR. Available Online. ---. 2015. Refugees endure worsening conditions as Syria’s conflict enters 5th year. Press release, March 12, 2015. Available Online. ---. 2015. Refugees/Migrants Emergency Response – Mediterranean. Accessed September 24, 2015. Available Online. ---. 2015. Syria Regional Response Portal. Accessed September 22, 2015. Available Online. UNHCR and United Nations Development Program (UNDP). 2015. 3RP Regional Refugee & Resilience Plan: Funding Snapshot – Top Donor Group Meeting, September 2015. Amman: UNHCR and UNDP. Available Online. United Nations Office for the Coordination of Humanitarian Affairs (UNOCHA), Financial Tracking Service. 2015. Total Funding to the Syrian Crisis 2015. Accessed September 22, 2015. Available Online. Wall, Indonesia. 2015. Response or opportunism? IRIN News, September 15, 2015. Available Online. World Food Program (WFP). 2015. Vulnerability Assessment of Syrian Refugees (VASyR): Preliminary Results. Rome: WFP. Available Online.